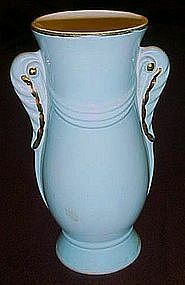 Nice powdwer blue vase measures 7" tall. simplistic with a drape and fancy handles. Gold edge trim and handle accents on one side. THe other soide does not have gold on the handles, in case you want a plainer look. No damages, good gold, no cracks, chips or wear.